There’s no shortage of really good RPG games on the PC, from the post apocalyptic future of Fallout to the vast dungeons and countrysides of the Elder Scrolls series, there’s enough hours to wile away exploring fantasy realms to fill up several lifetimes. 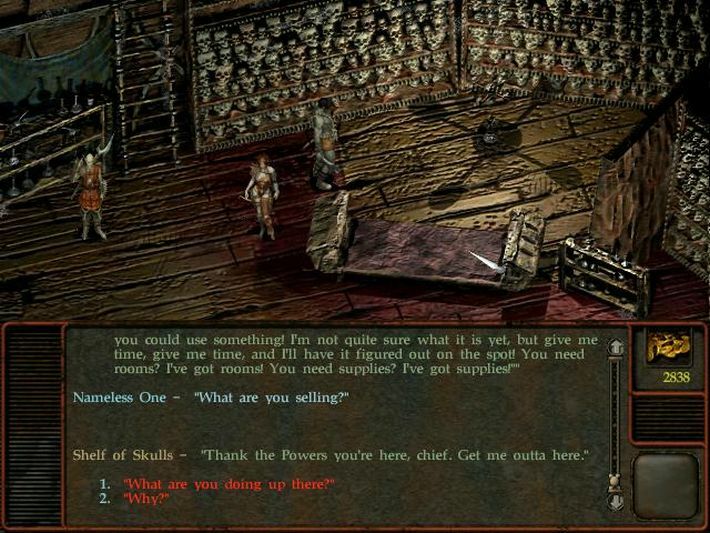 Planescape: Torment is yet another fantastic addition to the catalogue. Set in a more traditional dungeons and dragons style setting, you play the role of the “Nameless One”, an immortal warrior on a quest to find out the truth behind his immortality. Like many classic PC gaming titles, this is yet another game that has been kept alive by a dedicated fan community. There are several versions of this game that have been released, which makes writing a good installation guide a little difficult. The version we tested was the original 4 CD release. There’s also a version that came on DVD and a version sold by our friends over at GoG.com. The GoG.com version installs on modern PCs without any additional fuss, but for the CD release you should follow the steps below. Start by popping disc 1 into your PCs optical drive. When Windows asks you what you want to do, choose “Install or run program”. If this autorun prompt does not appear automatically, browse to the CD in Computer/This PC and run the “Autorun.exe” file manually. You should now follow the on-screen prompts to install the game. There’s one important change you need to make during the installation process however. When you get to the window that asks you to “Choose Destination Location”, you should click the “Browse” button and install the game to an alternate folder. Planescape: Torment requires read/write access to its installation directory and you will likely have difficulties installing mods and playing the game if you install to the default folder. C:\Games\Torment would be a good alternative, for instance. Once the main game is installed, you should manually install the data from the other three CDs. Put disc 2 into your computers optical drive and open it. The disc should have just one folder on it called “CD2”. 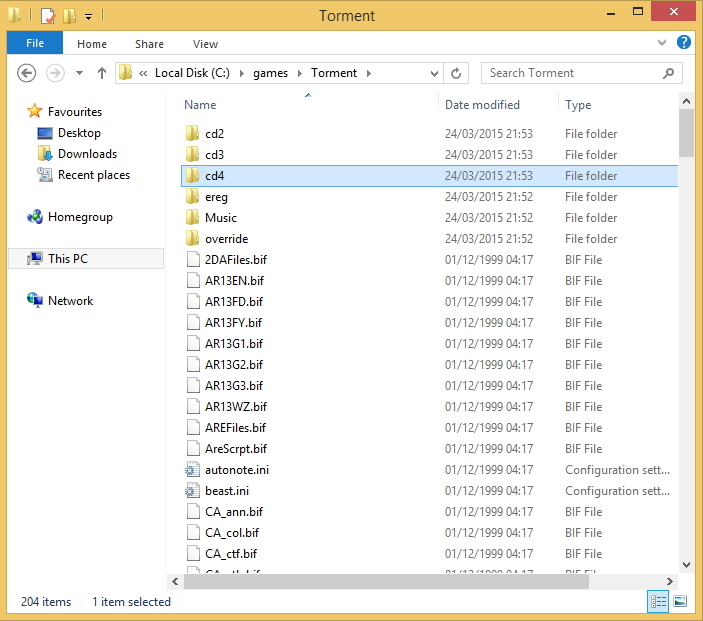 Copy this folder to your Planescape: Torment installation folder (e.g C:\Games\Torment). Once you’re done, repeat the process with discs 3 and 4, which have the folders “CD3” and “CD4” on them respectively. Once you’re done, the folder should look like the one shown below (when viewed in Details view). Now, we need to edit one of the files in the Planescape: Torment folder using Notepad, or your favourite text editor. The file we need to edit is called “Torment.ini”, so open it up in your preferred editor. If you’re not familiar with editing configuration files, see this tutorial. Once you open the file you should see a section at the top that says [Alias]. All we need to do is edit this section so that the game knows we have copied the CDs to our hard drive. This section has six lines, edit the lines that begin “CD2”, “CD3”, “CD4” and “CD5” so that they read like the lines shown below, assuming your installation folder is “C:\Games\Torment”. The CD1 and CD5 lines in the text file reference paths that don’t actually exist, so it probably doesn’t matter what you set those to. If your game is installed to a different folder then obviously you should substitute “C:\Games\Torment” for the path you used when installing the game. Before you save and close the file, there are a few other things you should edit. Find the [Config] section and edit the one line. Change it to 1, as shown below. Since all the games data files are stored on the hard drive now, we don’t need the game to cache them and doing so would just waste time and hard drive space. Optional tweaks – The following tweaks are also recommended but entirely optional. Find the section that begins [Program Options]. Now, find and change the following values for optimal performance on a modern PC, setting them as shown below. You can change the maximum frame rate to 60 if you like, but this seems to make the game run too quickly. You’re now done with installation, so let’s move on to patching. If you’re using the GoG.com download version of the game, you can skip this step and proceed directly to “User patches and mods”. Lets get the easy part out of the way first. The game has just one official patch which you can download here. Simply download the file and run it. It should detect the games installation directory automatically and patch accordingly. Prepare yourself for plenty of downloading and installing, as Planescape: Torment has a vast number of mods all created to help the game run better on a modern PC. As usual, we’ll try and pick out the ones that best enhance the game for modern PCs without dramatically changing the gameplay in any way. We’ll be going with the list of mods recommended over on GoG.com here and we’ll try and explain how to install them in as much detail as possible. Bigg’s Widescreen mod – This mod allows the game to run in higher screen resolutions than the original executable allowed. Although it’s called a “Widescreen” mod, it actually supports any resolution greater than 640×480. Note that using this mod may break compatibility with your old save games. If you played this game first time around then you might want to skip this part and just play in the regular old screen resolutions until you’re ready to start a new game. Start by downloading the mod from the page here. Simply use the big “Download Now” button on the right. Once the file has downloaded, double click on it to run it. Note that the mod does NOT automatically detect your games installation folder, so you will need to use the “Browse” button and manually browse to your “Torment” game folder. Click “Install” once you’ve done this. After a short delay, a command prompt window will open. Answer the questions as follows, pressing the keys indicated followed by enter. Choose your language – 0 (English). Would you like to display the Readme? – N (for no, you can read it later if you want to). 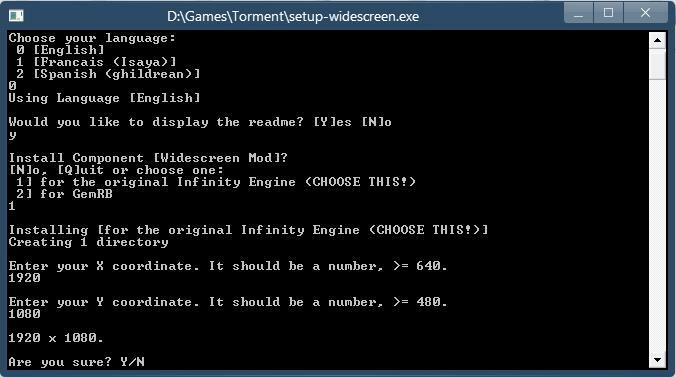 Install Component [Widescreen Mod] – 1 (for the original infinity engine). Enter your X coordinate – Here we need to enter the screen width. For instance, on a 1080p monitor you might enter 1920. A word of warning however, even though we’re going to install a patch that makes the games writing and other UI elements bigger, when you run this game at high resolutions certain elements become very small and can be hard to see. You might want to stick to 720p, especially if you’re playing the game on a TV rather than at your desk on a monitor. If you want to use 720p, enter 1280 here. Note that you CAN run the Widescreen patch again and change these values later if you decide they’re too big or small. Enter your Y coordinate – Here we need to enter the desired screen height. If you entered 1920 above, you’d enter 1080 here (or 1200, depending on your monitor). For 1280 above, you’d typically enter 720. Are you sure? – Y (for yes). Below is a screenshot example of installing the mod for a 1080p display. GhostDog’s PS:T UI mod – After patching the game to Widescreen, you’re definitely going to want to install this mod. GhostDog’s PS:T UI mod fixes various problems that have now been introduced as a result of running the game in screen resolutions that are several times higher than the game was ever designed for. Visit the page here and use the big green download button to download this mod. The mod is downloaded as a 7z file. To use it, you need to extract/copy all the files from within the 7z archive into your Planescape: Torment game folder. To do this you will need the popular free 7-zip tool. If you’ve never used 7-zip before, see this tutorial. 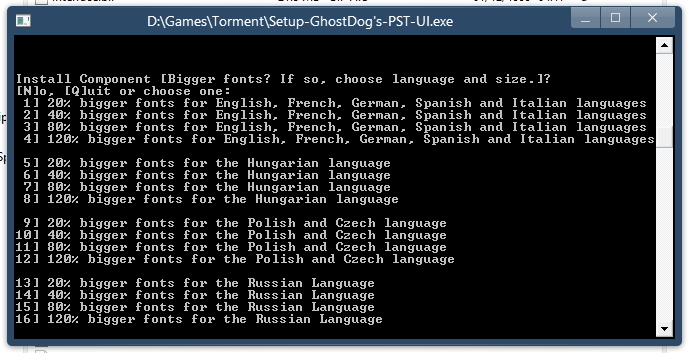 Once you have copied the files to your Planescape: Torment installation folder, run Setup-GhostDog’s-PST-UI.exe. Again, a command prompt window will appear. Type I and press enter to install the mod. You will then be presented with the choices shown below. Choosing the font size is largely a matter of taste. Have a look at this image to see how each font looks. At this point, the Gog.com guide we based this part of the article on advises trying the game and making sure it still loads, that’s not bad advice. Launch the game now and get at least as far as the title screen. If everything works, proceed on to the next mod. If not, start again from the top. If you still have difficulties, try temporarily disabling any antivirus software. PS:T Ultimate WeiDU Fixpack – You can think of this mod as a kind of unofficial patch, it fixes over 200 documented bugs plus roughly 4,000 corrections to spelling, grammar and punctuation within the games dialogue. You can download the mod here. This mod downloads as a .rar archive. Again, the popular 7-zip utility can handle this type of archive just fine. Copy the contents of the pstfixpack archive to your Planescape: Torment installation folder and then run “Setup-PST-Fix.exe”. Choose “0” to install in English. There are three options you can now choose to install. The Ultimate WeiDU Fixpack – Hundreds of bug fixes for the game. 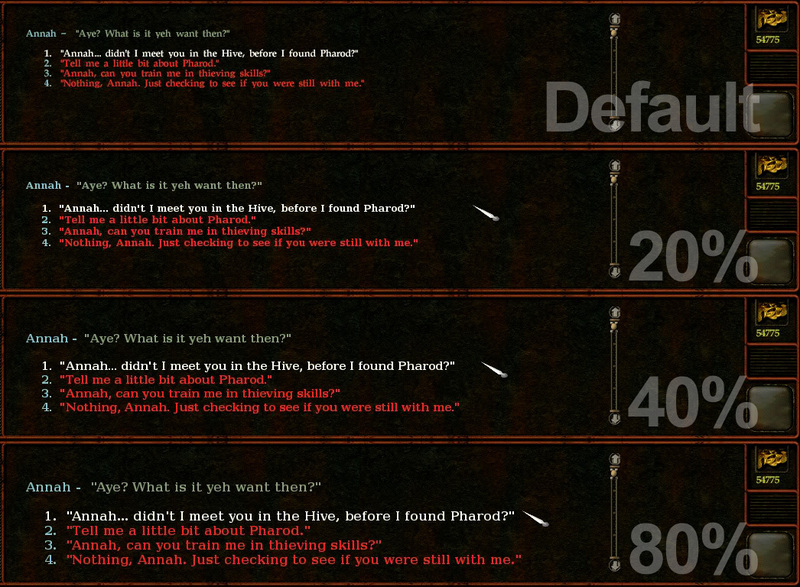 Dialogue Spelling/Grammar Corrections – Corrects mistakes in the game’s text. Unless you enjoy spotting typos yourself, you should install this. Subtitled Cutscenes – Optional but recommended. The cutscenes are important to the story and it’s annoying if you miss-hear someone. The last two mods we are going to look at now are optional, but highly recommended. Unfinished Business – It’s not unusual for a lot of content to be left out at the last minute from videogames. Typically things that didn’t make the cut due to time restrictions. Over time, fans of the game have found husks of code and other data relating to lots of unfinished quests and taken it upon themselves to finish them. The Unfinished Business patch adds many extra missions back into the game. Obviously, some of these quests may contain elements that fans have created, but this is still a highly recommended mod. You can download it here, again, by using the big green download button. This mod downloads as a .rar archive, so use 7-zip or your favourite archive tool to copy the contents of the pstub archive to your Planescape: Torment installation folder and then run “Setup-PST-UB.exe”. Like all the other mods we’ve installed, this one will ask you various questions as you install it. Some of which might seem a little cryptic if you’ve never played the game before. If this is your first play through, you should basically install everything except the cheat items. Tweaks Pack – Finally, our Gog.com guide recommended installing this mod. This is, as you might expect, a collection of small gameplay tweaks that fans have suggested. Download the mod by visiting this page. Once again, use 7-zip or your favourite archive tool to copy the contents of the psttweak rar file to your Planescape: Torment installation folder. Then, run the Setup-PST-Tweak.exe file. As with the Unfinished Business mod, you will have plenty of choices here and many will seem a little confusing if you’re not familiar with the games story. There were even some options that didn’t appear in the Gog.com guide we were following. As a rough guide, a new player should use the following options. Banter Accelerator (30 mins) – Install. Dustman Robes Area Restriction Removal – Install. BG2-Style THAC0 Display (makes your stats slightly easier to understand) – Install. Stackable Rings, Charms, Bracelets, Scrolls – Install. Explore City Areas – Install. Scale of Souls – Do NOT install. Save Nordom! Tweak – Install. Disabled Stat Minimums – Do NOT install. Maximized HP Per Level for TNO and Party – Install. Maximized Friends Spell – Install. No Battle Music – Do NOT install (unless you really hate dramatic music). Use Floating Text Font Globally – Do NOT install. Identify All Items – Do NOT install. Early Glabrezus Tweak – Do NOT install. Power Action Leprechaun Annah – Do NOT install. Easter Egg Morte – Do NOT install. Rest Anywhere – Do NOT install. Tome Of Cheats – Do NOT install. Add Quickload – Do NOT install. You can change your mind and add/remove any of these items later by running ‘Setup-PST-Tweak.exe’ again without affecting your game in progress. Phew! We’ve now installed the game, patched it and installed all the best user created patches and mods. All graphics and sound settings are pre-configured to their optimal so you can now simply start playing. All the games settings should be set to their optimal values now. If you do need to reconfigure anything (such as screen brightness) you can do so by pressing the Escape key while playing the game. This opens the games options menu. 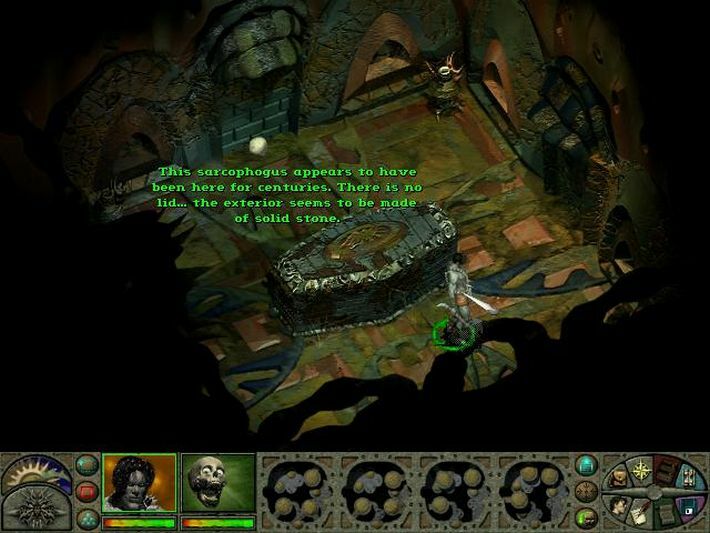 Like many games from this era, Planescape: Torment supports the now defunct EAX sound system in order to deliver enhanced sound effects in-game. EAX can be restored in most games, if you have a compatible sound card, by using the Creative Alchemy tool. We tried Planescape: Torment with Creative Alchemy but even after activating it, we still weren’t able to turn on EAX in-game. We’re not sure how big a difference EAX sound makes to the game having never played it on an EAX compatible machine. Poor performance in Windows 8 – We didn’t personally experience any performance problems when running the game in Windows 8. If you do, there are a couple of workarounds you can try. Firstly, you can try Aqrit’s ddwrapper. Simply visit that page and follow the instructions to download and install the wrapper. You may also need to edit the configuration file (aqrit.cfg) and make the following changes. You should also close every other application when you use this particular fix. If you leave any windows open, they have a nasty habit of flickering into the games graphics while you play. If the above option doesn’t work, you can also try Aqrit’s DDrawFix for Infinity Engine games, which you can find here. Don’t forget to delete all the files from Aqrit’s ddwrapper before you try DDrawFix. Problems installing mods and/or saving games – If you’re having difficulty saving your progress or installing mods, it’s likely that you ignored our advice while installing the game and installed it to the default folder, under the “program files” directory. Like many old titles, Planescape: Torment saves its game data into the same folder as the game itself. In some instances on more modern versions of Windows, this will mean that save games and configuration files cannot be written. To solve this problem, set the permissions on your game folder so that your user account has full control/read write permissions. You can find a tutorial on how to configure folder permissions here. The games default installation directory is “C:\Program Files\Black Isle\Torment”. If you hate trigonometry, this is the hell you end up in. This passes for cosy in this game. The game is full of spooky locations. Must be hell dusting all those.